Monica Maschak - mmaschak@shawmedia.com Vern Paddock loads ballot scanners onto a rack to prepare for distrubution to different county voting locations. 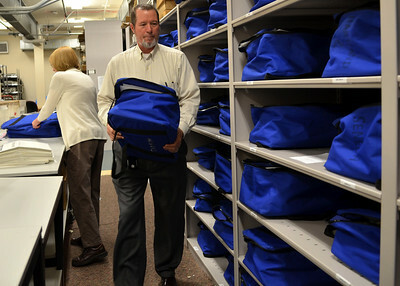 Monica Maschak - mmaschak@shawmedia.com Cheif Deputy Clerk Vern Paddock carries a precinct supply bag back to the shelf after Mary McCauley (behind) added last minute supplies. 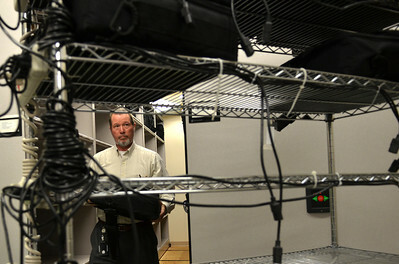 Workers prepared election matierals to be shipped to 212 polling precincts in McHenry County. Monica Maschak - mmaschak@shawmedia.com Judy Corson, election supervisor, reads off a list of polling centers that need rubber door knob covers in the basement of the McHenry County Administration Building on Thursday, November 1, 2012. Workers prepared and packed materials for distribution to 212 polling precincts in McHenry County. Monica Maschak - mmaschak@shawmedia.com Senior Tax Clerk Cathy Wisowaty double checks the ballot count for all of the 212 voting precincts on Thursday, November 1, 2012. 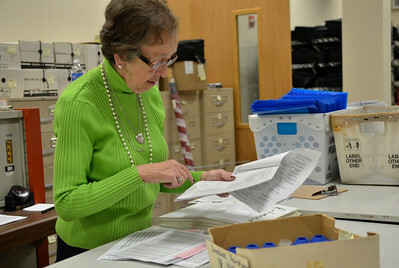 Ballots must be triple checked before distribution and use on election day. 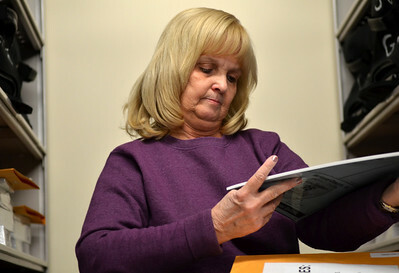 Judy Corson, election supervisor, reads off a list of polling centers that need rubber door knob covers in the basement of the McHenry County Administration Building on Thursday, November 1, 2012. Workers prepared and packed materials for distribution to 212 polling precincts in McHenry County.